Some retail stores have such lovely interior designs, they're hard to leave. Retail design is vital in order to capture the essence of a brand and put consumers in the right state of mind to unite their own style with that of the clothing in the store. 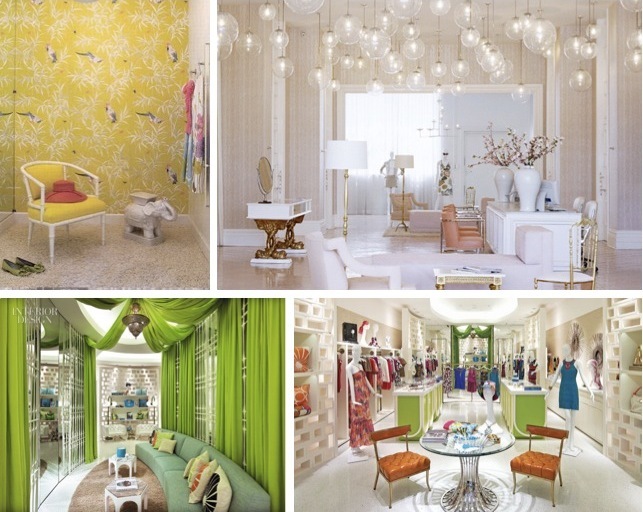 Tory Burch, Paul Smith and Trina Turk all have gorgeous store interiors that make me want to linger. Do you have a favorite? Tory Burch stores ooze sophistication and are known for their clean lines, lacquer, gold, lucite and pops of orange, green and purple. I love how her boutiques are designed to feel as if you are in a room of her home rather than a store. Graphic rugs and lust worthy tables take you inside what could be the home of a socialite and her shoes and clothing allow you to walk away with attainable luxury. Paul Smith's Milan boutique is captivating in pictures. The pink walls and large floral image make it feel as though you could be in a gallery. Sparse retro furniture in feminine colors and pop art elements further add to the brands cheeky, colorful and lovely clothing. Trina Turk stores are perfectly designed to capture the retro resort lifestyle that her clothes are made for. Each store takes you on a journey to a different location, while all maintaining 70's flair and vibrant colors mixed in with signature white lacquer elements. The fact that she has worked with design talents including Kelly Wearstler certainly doesn't hurt either. 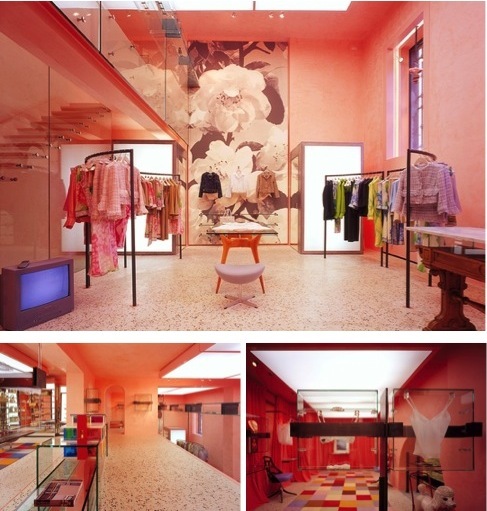 Love the Paul Smith Milan boutique...pink walls, yes please! It's kind of funny that I'm not much of a fan of either Trina Turk nor Tory Burch, but these are really lovely interiors! this is a great post, i never knew the term was "retail design" although it makes perfect sense. the design of store really makes a difference in the buying experience! Wow! Gorgeous spaces! Especially love the Tory Burch stores! Love the Trina Turk one! I just want to pack it all up and move it all into my new apartment! what a great idea for a post! i always notice the inside of stores decorations. Fantastic, I love the large floral image in Paul Smith store. Oh, what a selection you have here. hola! me encanta tu blog. So beautiful!!! Tory Burch and Trina Turk definitely have two of the nicest stores out there. 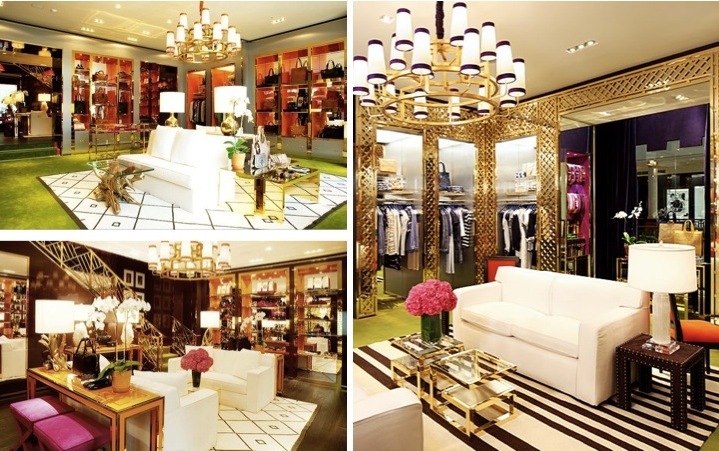 Jimmy Choo and Kate Spade also have some beautiful boutiques! Both stores are just so dang aesthetically pleasing! TO DIE. So pretty! I love the all white! These stores are gorgeous! I definitely notice the interior of stores when I go in. I think it helps set the mood for fun shopping! Those stores are amazing! Strangely a stores interior really does persuade me on purchasing decisions, I'm such a consumer! Nice! I'd love to pay a visit to that Paul Smith store! totally inspiration design - so bright! So true, presentation is everything. Plus, there's room and style inspiration in one! How gorgeous are those rooms?! I love anything with a chandelier. Thanks for your sweet comment, I'm loving your blog too!! Great Post, I absolutely adore your blog! Saw your feature on Tartans and Sequins, so cute!